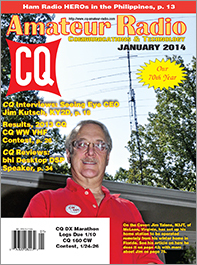 The January 2014 issue of CQ is informally a self-reliance issue. It wasn't planned that way, but that's how it turned out, as Editor Rich Moseson, W2VU, explains in his "Zero Bias" editorial. 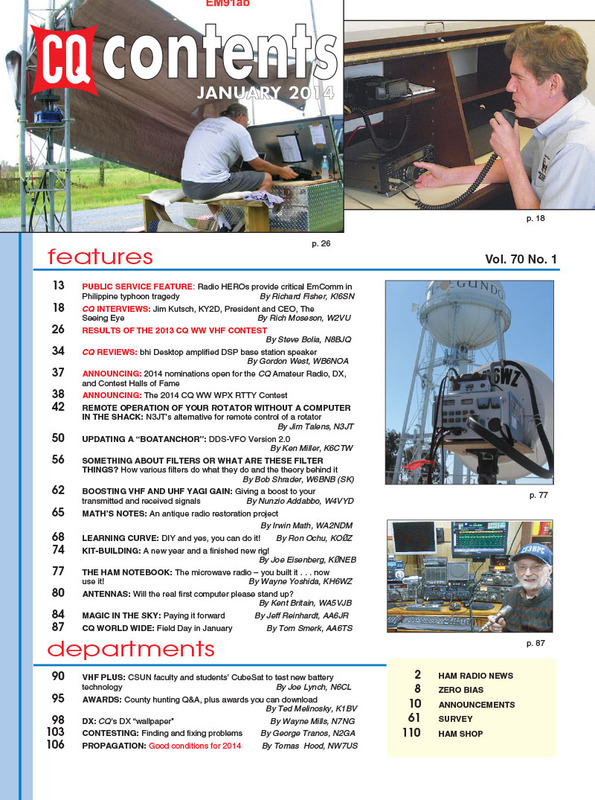 Our top story in this issue is Public Service Editor Richard Fisher, KI6SN's, report on the ham radio response to Typhoon Haiyan in the Philippines, as hams there demonstrated their self-reliance in the face of devastating storm damage. Next, we have a CQ Interview with Jim Kutsch, KY2D, the President and CEO of The Seeing Eye, which specializes in helping blind people become more self-reliant. Jim is a textbook example of ham radio self-reliance himself, having invented the first talking computer for the blind while pursuing his Ph.D. in computer science. Click here for our "Digging Deeper" supplement as well as audio of the complete interview. Completing our year-long realignment of contest reporting dates, we have the results of the 2013 CQ World Wide VHF Contest in this issue (complete line scores available only here on the web), along with the rules for February's CQ WW WPX RTTY Contest and the official announcement of the 2014 nominating period (Jan. 1 - Mar. 1) for the CQ Amateur Radio, Contesting and DXing Halls of Fame. The nominating form for the Amateur Radio Hall of Fame is here on our website. 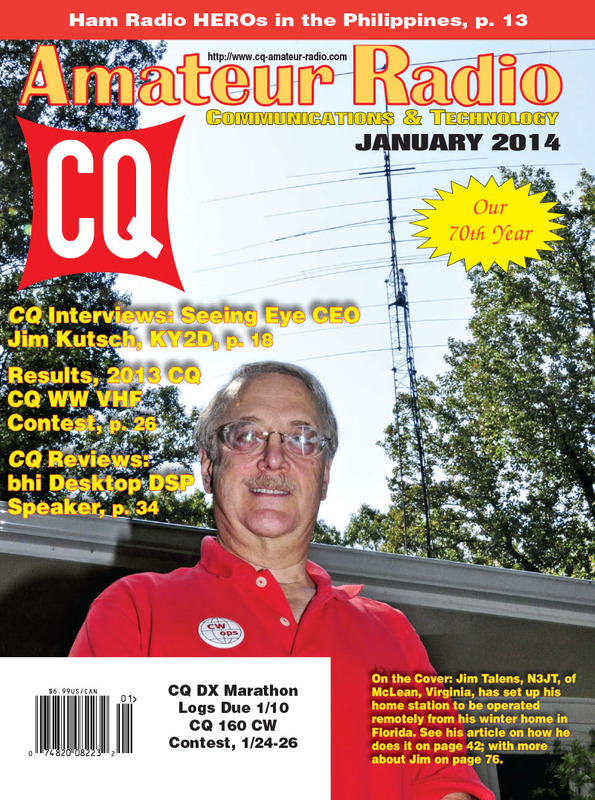 January 1 also marks the beginning of a brand-new CQ DX Marathon. Everybody's slate is wiped clean and we all start from scratch. Click here for the 2014 Marathon rules. Remember to submit your 2013 log by January 10, a new, earlier, deadline. Next, Contributing Editor Gordon West, WB6NOA, reviews the bhi Desktop amplified DSP speaker, and Jim Talens, N3JT, who's also on our cover this month, explains how he remotely controls his station - including his antenna rotator - over the Internet without relying on a computer in his shack. Ken Miller, K6CTW, shows us how he added a digital VFO to a classic "boatanchor" radio; we have a tutorial from the late Bob Shrader, W6BNB, on the basics of filters, and Nunzio Addabbo, W4VYD, explains how to boost the gain of VHF and UHF Yagi antennas by converting the reflector into a split paraboloid. Moving to our columns for this month, "Math's Notes" editor Irwin Math, WA2NDM, returns us to our self-reliance theme with an antique radio restoration project; "Learning Curve" editor Ron Ochu, KO0Z, keeps us there with his column on "DIY (Do-It-Yourself) - and Yes, You Can Do It;" Kit-Building Editor Joe Eisenberg reports on his latest project and "Ham Notebook" editor Wayne Yoshida, KH6WZ, wraps up his series on building a microwave transverter (more self-reliance) with "The Microwave Radio - You Built it, Now Use it!" 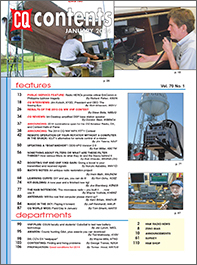 Antennas Editor Kent Britain, WA5VJB, goes slightly off-topic this month with a fascinating look back at a little-known chapter in the early history of computers; "Magic in the Sky" editor Jeff Reinhardt, AA6JR, writes about "Paying it Forward," and International Editor Tom Smerk, AA6TS, reports on "Field Day in January" (in Chile) as well as other ham radio news from around the world. "VHF Plus" editor Joe Lynch, N6CL, reports on a ham radio cubesat that will test new battery technology in space (Joe, who is also a Methodist minister, has just moved from Oklahoma to New York, where he's starting a new job as Director of Religious Education at the U.S. Military Academy at West Point. Congratulations, Joe!) Awards Editor Ted Melinosky, K1BV, answers questions about the USA-CA award and reports on awards you can download and print yourself once you've qualified; this month's DX column takes a look at CQ's own series of DX awards, and Contesting Editor George Tranos, N2GA, takes us back to our self-reliance theme with a column on finding and fixing problems in your station. Finally, Propagation Editor Tomas Hood, NW7US, predicts good conditions on the HF bands for 2014. That's a brief look at what's coming up in the January issue of CQ magazine. For information on becoming a CQ subscriber, click here. Happy New Year from all of us at CQ! STARTING IN FEBRUARY: CQ PLUS … an expanded digital edition integrating the best of Popular Communications, CQ VHF and WorldRadio Online!